The Spicy Kimchi Miso Ramen at Koji Ramen Bar. Photo by Jim Robertson. Houston has some terrific ramen restaurants but until now none of them were in or around Spring or The Woodlands. 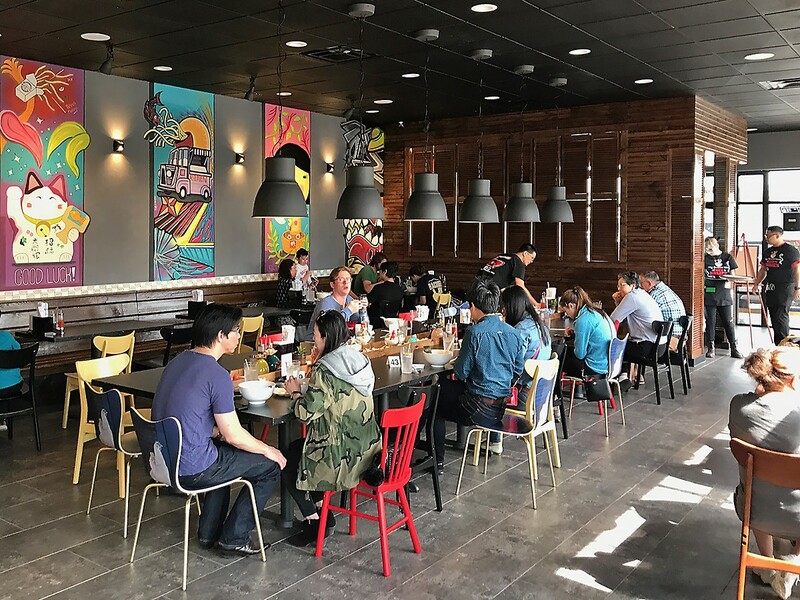 Koji Ramen Bar at 25403 I-45 in Spring (no relation to Koji’s Ramen Bistro at 13207 Jones in Houston, according to a Koji Ramen Bar employee) opened its doors on Friday, February 23 to quite a crowd. It’s conveniently located (and easily accessible) on the feeder road near Sawdust. Even though Koji just opened, the impressive interior design and architecture gives the impression of a Japanese restaurant that has been open for many years. A long, central table that spans the length of the dining room has communal seating and even the variety of chairs gives the impression that the restaurant has existed for a long time. Large, hand painted murals lend to the ambiance in a way that says you are in a ramen bar. There are tables around the sides of the room as well for diners who prefer a little more privacy. The communal table at Koji Ramen Bar in Spring. Photo by Jim Robertson. The minimalist menu focuses on ramen, of course, and interesting appetizers. 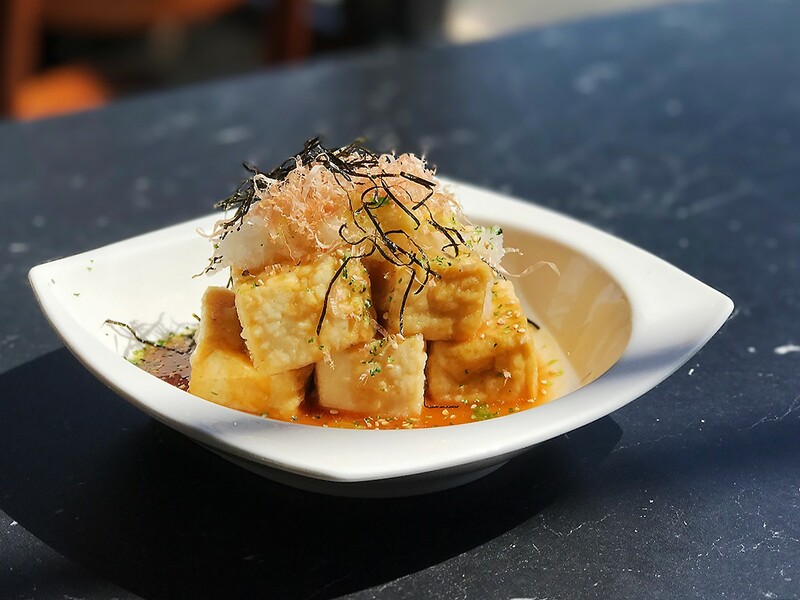 The lightly fried agedashi tofu is just as the menu says: silken on the inside and served in a traditional dipping sauce that is quite flavorful. 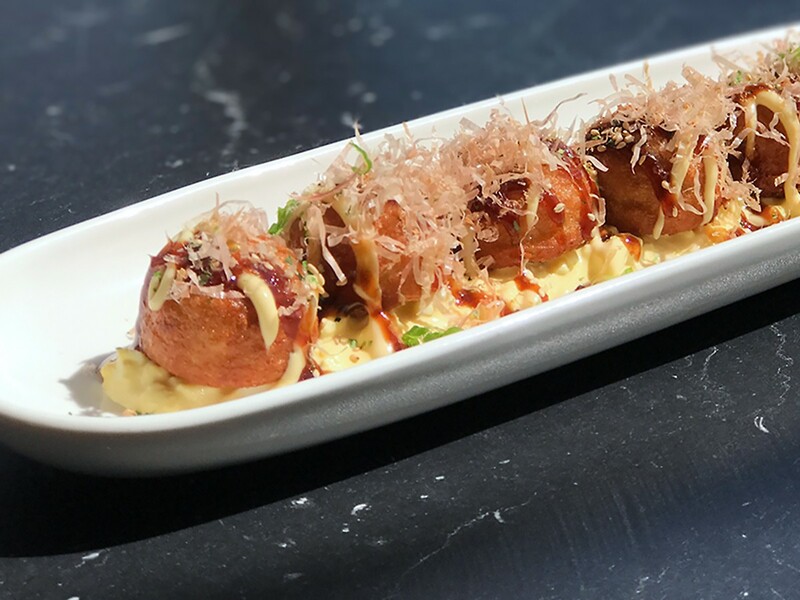 The takoyaki, another classic appetizer of battered and fried octopus balls served over sauce, contrasts nicely with the tofu thanks to subtle seafood flavor and light crunchiness. Both appetizers are so well-executed that together these would make a great light lunch or dinner. Agadashi tofu at Koji Ramen Bar. Photo by Jim Robertson. Of course, the main attraction of Koji is the ramen. Diners can choose from four ramens and a soba noodle dish. Of particular interest is the Spicy Kimchi Miso Ramen, a combination of ingredients that might not seem immediately compatible, but are. The miso-pork broth is laden with corn, braised pork, scallion, a soft boiled egg, red pepper threads, kimchi, pickled ginger, two big pieces of nori and ramen noodles. Traditional ramen bowls are on the menu as well, such as tonkotsu and miso. Two of the noodle selections are good options for those not looking for a pork broth-based ramen. The Abura Soba is “Japanese style soup-less oil noodles.” There is also a vegan ramen; a vegetable-based stock with noodles and all of the traditional trimmings, minus of course the chashu, or sliced pork roll. Takoyaki at Koji Ramen Bar. Photo by Jim Robertson. Koji offers a limited beer menu and even has a small bar near the entrance. Both domestic and Japanese beers are on offer—but the Japanese ones pair best with ramen. 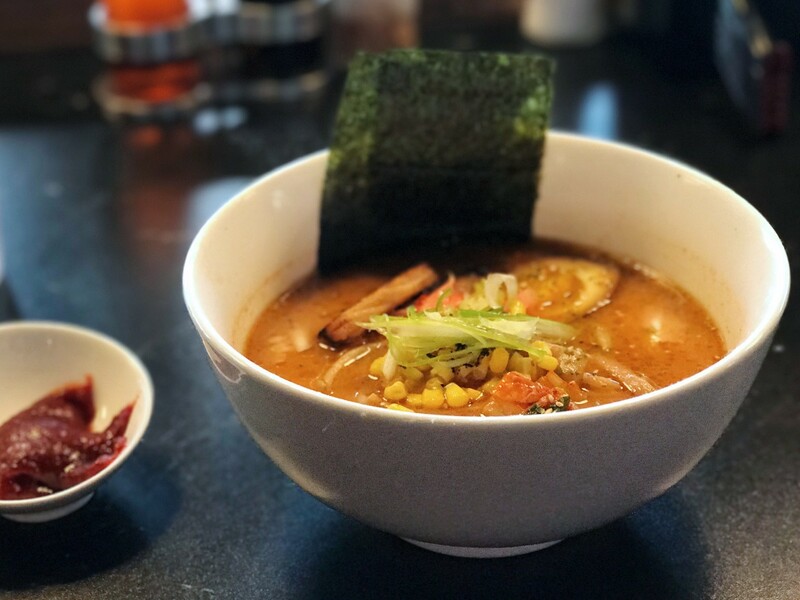 The new ramen bar is already drawing crowds, so for weekday lunchtimes, get there a little before noon as there might be a line. The verdict: Koji is a welcome addition to the Houston’s ramen scene and certainly to North Houston and The Woodlands, which haven’t really had a ramen scene before. After only two weeks in operation, Koji is already a winner that will likely only get better with time. Koji Ramen Bar, 25403 Interstate 45, Suite A, Spring, 832-823-5187: Open daily from 11 a.m. to 9 p.m.—but call ahead if going early or late as the hours are still being sorted out.